mtbdudex, Reddig, zibaji and 1 others like this. Last edited by imagic; 04-05-2017 at 09:33 AM. This app definitely ups the game for Audyssey vs other room correction options. My work friend has a Marantz SR 6011, his room is just being finished this week, speaker layout is 5.2.4., DIY soundgroup all around 1099's up front, Fusion-8's rears, and Volt-10 for the top. One 18" ported sub to start, then he will add a 2nd one this fall. We will use this app to help fine tune the acoustics, along with REW and treatments. Would 7010 be classified as 2016? George Montemayor and bommai like this. I'll stay away from details. Edited. Here's the list, I did not explicitly check release dates for each one. The following existing AV Receivers will support the MultEQ Editor: Denon AVR-X6300H, AVR-X4300H, AVR-X3300W, AVR-X2300W, AVR-X1300W, AVR-S930H, AVR-S730H, AVR-S920W, and AVR-S720W. Also, Marantz AV7703, SR7011, SR6011, SR5011, and NR1607. Does this, "adjust the overall EQ frequency roll-off for each channel pair", mean the high-end roll-off or does it mean the EQ "rolls off" (i.e. stops correcting) at a chosen frequency? Or, to get to the point, can we use this to select the frequency that EQ stops working so it only EQs the bass? Such a thing may be nicer than the "L/R off" feature for those who run their mains at lower crossovers or full-range. Edit- not sure, wording is not totally clear, will check into it. Last edited by imagic; 04-05-2017 at 09:39 AM. Doesn't make sense to have a select-able roll-off (in the classic sense of the word) when the curve definition should already tell it how to roll-off the highs. I wonder if they didn't mean cut-off instead; regardless, I just want to know if I can instruct it at what frequency to stop applying EQ to my mains, lol. Thanks for inquiring. If I were able to disable the room correction above 200hz, I would enable Audyssey. Above that region all it's doing is harming the flat frequency response from the direct sound to make the reflections sum flat in the average of multiple locations. nathan_h and BGLeduc like this. In a subsequent story, there appears to be a sudden, unexplained flurry of Denon and Marantz units heading to the AVS for-sale threads. muzz, head_unit, sdrucker and 8 others like this. Last edited by Molon_Labe; 04-05-2017 at 01:12 PM. OK found this on iTunes, so it looks like we are talking about an adjustable range for the EQ. Sorry no details, I'm trying to get a compatible device to try this out ASAP. 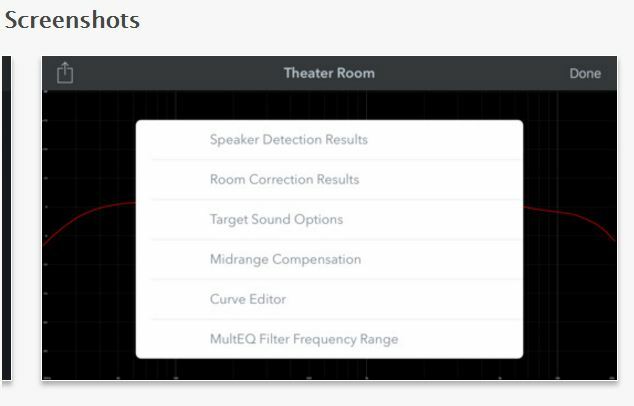 Yes, can choose upper frequency that the room correction is applied up to. I have mine set to 150 hz (Schroeder for my room) and am only getting corrections below this. You can also tailor the curve to remove roll-offs or add house curve and there is a setting to remove midrange compensation (BBC dip) automatically. nathan_h, imagic, Snowmanick and 3 others like this. Lots of what made Dirac so great to use, now in Audyssey. Awesome. Wonder how easy to use the app will be for a newbie like me who don't understand much of frequency's etc. Still, my next AVR is def. either a Denon or a Marantz b/c of this awesome feature. In a subsequent story, there appears to be a sudden, unexplained flurry of Denon and Marantz units to the AVS for-sale threads. This looks like it could be very good. I'm excited to see more info as people start using the app! they have that. It's called LFE+Main. It'll push the sub crossover frequencies to the subs as well as the mains. no 7010. From a sales perspective I get it; from a customer service perspective I'm let down. nathan_h, gregoryperkins, christoofar and 4 others like this. This is a big plus for Audyssey owners, but I don't think its going to close the gap on the superiority of Dirac's algorithms and impulse response corrections vs Audyssey. The target editor is just icing on the cake with Dirac. Still a big win though and something that Audyssey has been far too long missing. OzHDHT, stef2, Fattykidd and 1 others like this. I have a Marantz 7009 with MultEQ XT32 (the best version) and I keep Audyssey disabled at all times because I don't want it to EQ frequencies above the room transition frequency (around 200 - 500 Hz for most rooms). This is a huge improvement if you can EQ only the bass frequencies and your receiver is compatible. It looks to me like Dirac is way ahead of what Audyssey does. An iPad app will barely help fix that. Sounds good, but...if I tell it not to correct above 150hz why would the MR compensation play a part, shouldn't it leave that alone when I tell it not to touch anything above that? Or is that a separate thing (along with the HF rolloff selection)? That's not what I was driving at. The "L/R off" I was speaking about was a feature selection to turn EQ all the way off on the mains. But, if you're listening to your mains without a sub, you probably want some EQ there below Schroeder. So, only having the choice to EQ everything or nothing isn't desirable; especially so for these folks. Between this announcement and the poll showing that most people find Atmos more immersive than HDR, I may have to adjust my priorities to upgrade my AVR and figure out how to add ceiling speakers. I can easily reach the attic above the living room which may give me more options. So sad that my flagship marantz 8802a cant use this. Strange that Marantz s current flagship piece of equipment cant somehow be updated to accept this. Schwa, nathan_h, markrubin and 9 others like this. Let's hope there will be more. I have an 8 month old x4200! Correct, separate things. If you limit frequency below BBC dip you don't even see that part of the curve. But if you were behind an acoustically transparent screen or have a particularly live room some full range EQ may be appropriate and it is soooo much more flexible now. What is interesting (but I haven't actually tested to see if it works in the receiver) is that you can edit the correction curve below what I assume is the calculated roll-off of the speaker. It defaults to a smooth roll-off but can be edited. Could be helpful in some circumstances. Last edited by shoeboo; 04-05-2017 at 11:05 AM. I can't imagine why the Denon X7200WA won't be able to utilize this app. but every AVR model below it can. marky301067, mtbdudex, Lesmor and 7 others like this. Life is but a beautiful dream and death is it's rude awakening. Can someone explain, in simple terms, what this app gives the average user that may want to do basic tweaking etc. ez1dog and loveracing1988 like this. Not too long ago I noticed that one of the two Marantz Android Apps stopped working after it was updated. Now I'm down to one for the 7010. This new Audyssey app not being available for the 7010 as well, I guess I'll work both Audyssey and REW together. ahhh, I see. Sounds like a cool idea. Yes, that's the whole point of room correction. If you were to have a floating room full of non parallel surfaces, diffusers, and traps, you wouldn't need room correction tools. Most of us don't have that, therefore we do. sdrucker and smo0thie like this. sdurani, MentatYP, mthomas47 and 2 others like this.